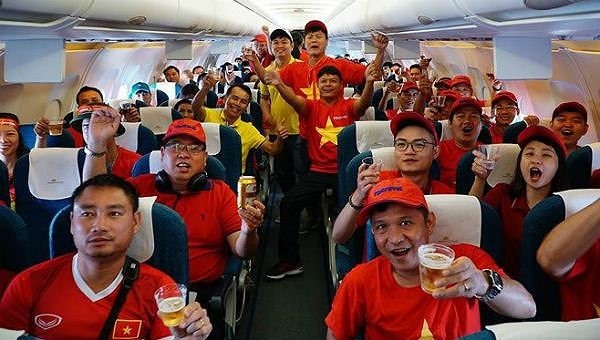 Vietnamese fans are heading to the United Arab Emirates (UAE) to support the national football team for the AFC Asian Cup 2019 quarter-final against Japan on Thursday. Football tours have been organised by Vietravel, HanoiRedtours and Saigontourist. Vietravel will co-ordinate with Vietnam Airlnes (VNA) and Masan Group to organise direct flights to the UAE: Hà Nội - UAE and from HCM City – UAE. Tour prices offered by Vietravel start from VNĐ28 million (US$1,200) with a ticket to watch the game and visit several sites in Dubai. “There is nothing more precious than the presence of fans at the stadium when Việt Nam play. We will bring about 300 fans to the UAE. We have also invited Việt Nam’s head coach Park Hang-seo’s wife to the UAE,” said Nguyễn Quốc Kỳ, Vietravel’s general director. In the knockout match with Jordan, around 2,000 Vietnamese fans living and working in Dubai cheered on the Vietnamese team. The upcoming match will take place at the Al Maktoum Stadium in Dubai at 8pm on Thursday (Việt Nam time). Japan reached the quarter-finals after beating Saudi Arabia 1-0 on Monday with a header from defender Takehiro Toniyasu in the 20th minute. On January 20, Việt Nam advanced to the quarter-finals after a breath-taking shootout with Jordan.